Dr. Gerald Pocius of the Department of Folklore was recently named a Fellow of the American Folklore Society at a ceremony in Providence, Rhode Island. 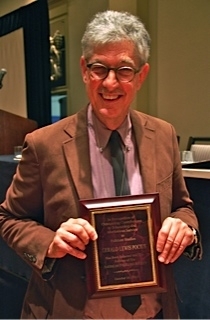 “With his stellar record of scholarship, outstanding service to the field, particularly in Canada, and impressive array of awards, Dr. Pocius deserves this high honour and serves as a model for others to follow,” said Dr. Simon Bronner, president of the American Folklore Society Fellows. According to the American Folklore Society’s website, the Fellows of the American Folklore Society is an honorary body of folklorists, established in 1960, whose election signifies their outstanding contributions to the field. The American Folklore Society was established in 1888 and its membership includes academics, museum curators, librarians and others involved in the study and promotion of folklore and traditional culture. A University Research Professor who has taught at Memorial since 1977, Dr. Pocius is also a Fellow of the Royal Society of Canada. From 2002-10, he was a member of the Canadian Commission for UNESCO, working primarily on intangible heritage issues.